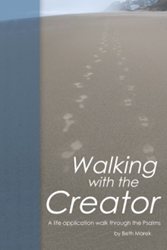 Beth Marek marks her publishing debut with the release of “Walking with the Creator” (published by WestBow Press), an inspirational book reflecting the message of the Book of Psalms to every person’s daily living. Readers can know more about the book at https://www.westbowpress.com/Bookstore/BookDetail.aspx?BookId=SKU-000935620. “My passion is to read the Bible daily. I found that what I was learning each day and what was giving me hope each day was doing the same for others. I assembled a collection of these lessons to pass along this hope to more people,” Marek shares, on her inspiration in penning the book. “Walking with the Creator” applies the Book of Psalms to people’s daily life, giving them hope, joy and peace that they are looking for in today’s world. It reminds them to look to God for his help and direction and to lean on him over one’s own strength. “We all need someone at times to tell us to keep going and to hang on. We look for that one person that will reach out their hand to help and guide us. I want this book to be that inspiration,” Marek says. Beth Marek, a speaker, teacher and mother of two, lives in New Berlin. An award-winning artist with a passion for sculpting, she applies her creative talents to vividly worded stories sculpted into life lessons, inspiring many to a closer walk with God.